I loved this novel. Hidden within multiple questionable accounts is the story of the One Who Has No Name, the Whatsitsname fashioned from the mutilated corpses of US-occupied Baghdad’s many victims of violence. Supposedly formed by the hands of Hadi, the drunken junk dealer and teller of tall tales in coffee shops, the Whatsitsname takes on the spirit of a bombed man whose body was blown apart and whose spirit was unable to find its resting place. 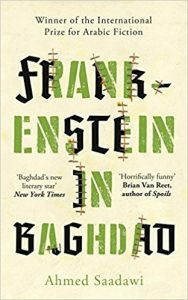 The Whatsitsname moves across Baghdad initially enacting revenge for all the bodies that form its whole, but once each body part is avenged it starts to rot and drop from his body requiring new parts and so new deaths. While the Whatsitsname first sees himself as avenging the innocent, how can he be sure every part that makes him whole is without taint? ‘Each of us has a measure of criminality,’ one of his followers tells him (p156). If he needs to replace a part of his body quickly, is killing a man who is about to die in crossfire a criminal act or a hastening of inevitable death? Is he the first embodiment of a true Iraqi citizen, made up of bodies of diverse backgrounds? Is he a saviour or a monster? A hero or a criminal? The morality of revenge, of possession, the judgement of good and evil, of justice and law and order are all questioned as the complexity of this creature, its origins and its compulsions, along with how the story is told, are played out across many lives from a lonely old woman longing for her missing son that everyone else assumes is dead, to journalists and government officials. The novel is clever, intricate and provocative, drawing on literary traditions that span the world. It is simply gripping. The kind of book that builds on what has gone before, from Shelley and the Arabian Nights to Kafka, and creates something new, a hybrid like its monster that shows a possible way to create new things out of chaos, new things that reveal the world we live in and question it. The ugly truth rots at the touch and belief, in all its forms religious and magical, is constantly revealed and covered like the building the Whatsitsname shelters in where Hadi and the old woman live. Beneath this building a bomb reveals ancient Jewish ruins of major archaeological significance, holy ground, that the authorities fill with soil. There is so much to uncover in the various stories that form the whole, such care taken in the weaving of these lives, that makes it a very deserving winner of the International Prize for Arabic Fiction. It is also shortlisted for this year’s Man Booker International Prize. Now more people need to read it.